One of the joys of working on the water is the rate at which salt water can take its evil toll on camera equipment. Water and cameras don’t mix, but in my line of work they have to. One problem I regularly encounter is my UV filters get stuck on the front of my lenses. The reason I use ultra violet (UV) filters is that in order to remove water from my lens, I have to rub them with a chamois leather. I explained the process in this post Clear vision. When I need to get the shot I can’t gently wipe my lens again and again until the water has gone, speed is of the essence, well speed and good results – no good being fast if it damages my lens or ruins the image quality. When wiping my lens I wipe in a clockwise direction to avoid un-screwing the filter, throw some salt water into the mix and it’s no wonder I regularly find myself having to remove a reluctant filter from the front of my lens. There are clamps you can buy to do this job, but why spent money when the answer is sitting in front of you? If not in front of you, every house has the solution. All you need is a length of cable, flattened electrical cable works best, but any bit of cable substantial enough will do. Simply wrap the cable snugly around the problematic filter and squeeze the ends tight. 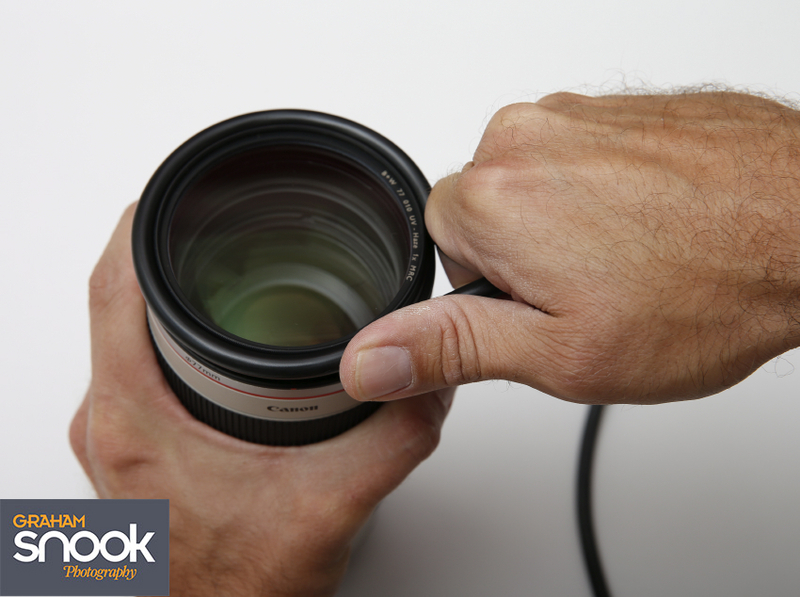 Hold the lens firmly and unscrew the filter. With any luck the filter will ease off, unless of course you’ve dropped your lens and it’s dented the filter and distorted the barrel. If that’s happened the action needed is a bit more extreme, but I’ll save that for another day. Apologies about the paint on my thumb, it was a bank holiday weekend here in the UK, and I took the opportunity of some work free days to do some painting around the house!